1. Can the YS480 & YS640 be built into an outdoor kitchen? Yes, definitely. Both models can easily be built in with no structural alterations to the BBQ. 2. What are the differences between the YS480 and the YS640? There are two differences between the YS480 and the YS640. The first is size. The cooking surfaces are 33% larger on the YS640. The second difference is the addition of the Variable Displacement Damper (VDD) in the YS640. 3. What is the cooking area on the YS480 and the YS640? The cooking area on the YS480 is 51cm x 61cm on the main grates and 39cm x 50cm on the 2nd shelf. The cooking area on the YS640 is 51cm x 81cm on the main grates and 39cm x 71cm on the 2nd shelf. 29.8 cm with the 2nd shelf removed. 5. What gauge of steel is used? 6. What are the overall dimensions of the cookers? The YS480 is 135cm long (including the side shelf), 137cm tall and 89cm deep. The YS640 is 155cm long (including the side shelf), 137cm tall and 89cm deep. 7. What are the cooking grates made of? The main cooking grates are constructed of 6.5mm steel bar and then finished with a hard chrome surface. 8. What is the 2nd shelf cooking grate made of? #9 expanded metal contained in a 12mm square tube frame. 9. Are the outside front and side shelves & inside second shelf standard? 10. What are the front and side shelves made from? The front and side shelves are constructed from 11mm round bar frame with 8mm round bar cross pieces and then finished with a hard chrome surface. **Solid Stainless Steel shelves are optional on the standard cart and standard on the Competition cart. 11. What are the dimensions of the front and side shelves? YS480: front shelf is 31.5cm deep x 58.5cm wide; side shelf is 48cm deep x 38cm wide. YS640: front shelf is 31.5cm deep x 78.5cm wide; side shelf is 48cm deep x 38cm wide. 12. Is there enough clearance to open the door with a full size restaurant pan sitting on the front shelf? Yes, there is over 101mm of clearance between the bottom of the door and the front shelf. 13. How do you move the cooker around? The standard cookers are fitted with a set of wheels and casters so it moves easily across hard surfaces. The shelf on the Right Hand side doubles as a handle for moving the grill across turf or uneven surfaces. The Competition Cart model has 4 x 203mm pneumatic tires for handling changing terrains. 14. What is the hopper capacity? The hopper holds a 9kg bag of pellets. 15. What’s the temperature range? The temperature range is from 65 degrees C to 315 degrees C ( 150 F to 600 F ). 16. Are they easily switchable between Celsius and Fahrenheit? Yes, at the press of a couple of buttons, you can run them in either Celsius or Fahrenheit. 17. How do you control temperature? The temperature is digitally controlled in 5-degree increments in either Celsius or Fahrenheit. 18. How long will it run on a hopper full of pellets? The cookers will run up to 12-hours depending on the cooking and ambient temperatures. 19. How many pellets are used in a long slow smoke? Pellet consumption ranges from .68kg to 1.8kg per hour depending on the cooking temperature and environment. A 9kg bag of pellets usually lasts for about 12-hours with the cooker set to 105C ( 225F ). 20. How long does it take to heat up? The heat up period for direct grilling is 10 to 15-minutes. The heat up period for indirect cooking is 20 to 30-minutes. 21. Where is the firebox located? The firebox is located on the Left Hand side of the pit. 22. Why did you locate the firebox on the Left Hand side? Airflow is less volatile from left to right (firebox to chimney) than a centre mounted firepot, so the Left Hand placement significantly reduces the hot spots in the corners and in the front and back edges of the cooker which allows the cook to utilize more of the cooking area. 23. What makes the Yoder such a Versatile Cooking System? The Yoder Pellet Cookers offer two unique setups depending on the style of cooking that you want to do. 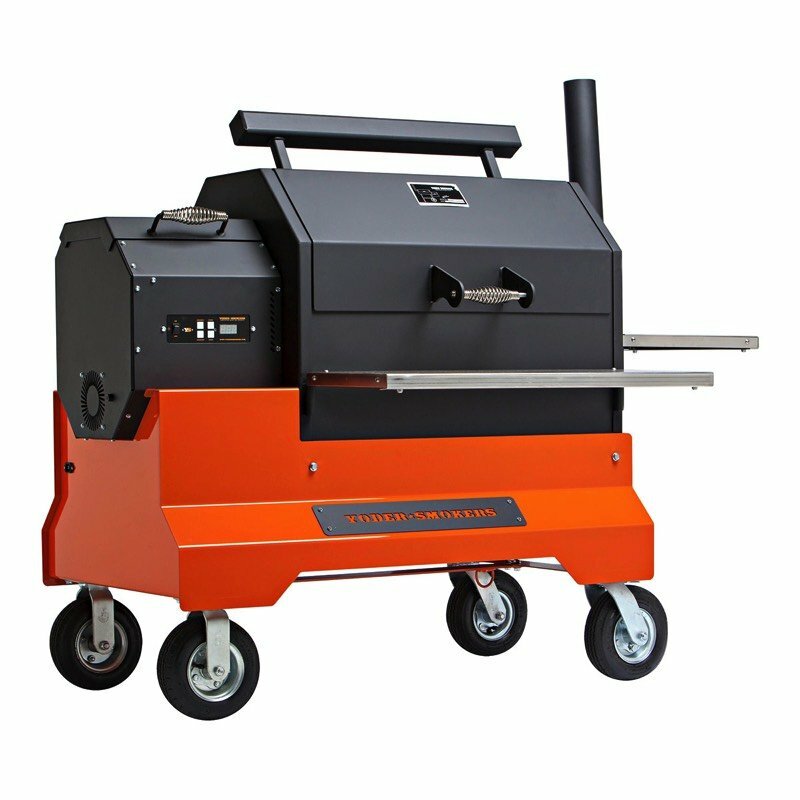 The first is the traditional pellet grill setup, which has the heat diffuser in place; this is the ideal setup for smoking and baking. In this setup the air and smoke travel through the length of the cooking, similar to an offset wood pit, imparting excellent colour, flavour and texture into the food. 24. How does the Variable Displacement Damper (VDD) work? When the YS640 is setup traditionally (heat diffuser in place) the Variable Displacement Damper allows the operator some additional grate level temperature control. With the damper pushed all of the way in the left half of the grill will run hotter, when positioned all the way out (open) the right end of the grill will run hotter. With the damper pushed in about 127mm the grate surface will cook fairly even, which creates the ideal environment for slow cooking similar cuts of meat. With the direct grill kit in place it is recommended to open the damper all the way to allow the heat to develop across the entire cooking surface. 25. How does the direct grill option work? There are two ways to utilize the direct grill option, first is to remove the original grate or both grates and install the GrillGrates over the diffuser. This creates and ideal grilling environment for wings, chicken breast and other meats that benefit from slightly less direct heat. The full direct method is created by removing the heat diffuser and then replacing the standard cooking grate or grates with the direct grill kit which is perfect for cooking burgers, steaks, thick chops and similar cuts of meat. 26. What temperature will the direct grill surface achieve? With the Aluminium Cooking Rails in place and the diffuser out the grate temperature can quickly climb past 370C ( 700F ) depending on the set point. 27. Can I sear a steak on a Yoder Pellet grill? With the Aluminium Cooking Rails in place you can sear a steak and achieve the cooking time, colour, texture and grill marks previously associated with cooking over gas or charcoal. Commercial Warranty: Please contact us. 29. How does it ship to me? Most commonly the YS Pellet grill is shipped fully assembled, but in Country areas it may require some minor assembly. 30. How is the best way to clean the inside of the pit? Start by disassembling the pit, vacuum the body, use a thin blade putty knife to remove any buildup and finish by wiping down with a citrus based cleaner. 31. Can they operate in the rain? Yes, in the USA Yoder Pellet Grills often cook out in the rain ( see the photo below of a YS640 cooking while snowing ), but like anything it will keep looking better longer if it is kept under cover.